Every Grand Opening needs contest entry blanks and we have them pre-printed and in stock for your event! Red cardboard door prize box or registration box. 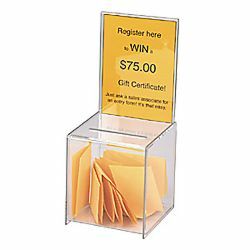 This box is ideal for event contests and promotions. It has the room for you to attach an 8.5" by 11" graphic on the front, and a half-sheet on the removable header. White cardboard door prize box or registration box. 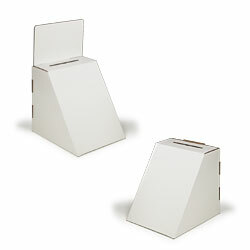 This box is ideal for event contests and promotions. It has the room for you to attach an 8.5" by 11" graphic on the front, and a half-sheet on the removable header. 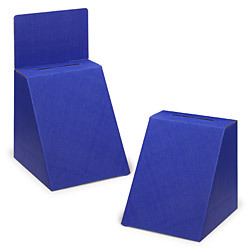 Blue cardboard door prize box or registration box. 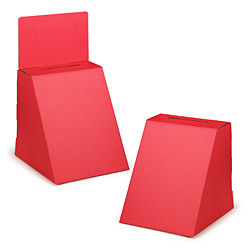 This box is ideal for event contests and promotions. It has the room for you to attach an 8.5" by 11" graphic on the front, and a half-sheet on the removable header. Large frosted acrylic door prize box or registration box. The clear header is designed for 8 1/2" x 5 1/2" insert and doubles as non-locking sliding access door. Clear acrylic door prize box or registration box. The clear header is designed for 5 x 7 insert and doubles as non-locking sliding access door. 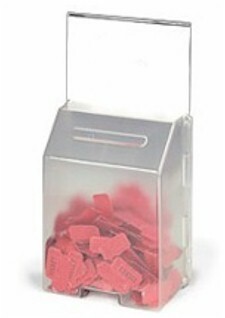 Large clear acrylic door prize box or registration box. The clear header is designed for 8 1/2" x 5 1/2" insert and doubles as non-locking sliding access door with an extra wide entry slot. Make trade shows and events more fun at a fraction of the cost of most prize wheels.Click image for details. Pick your raffle winners at your event with this beautiful brass plated raffle drum.